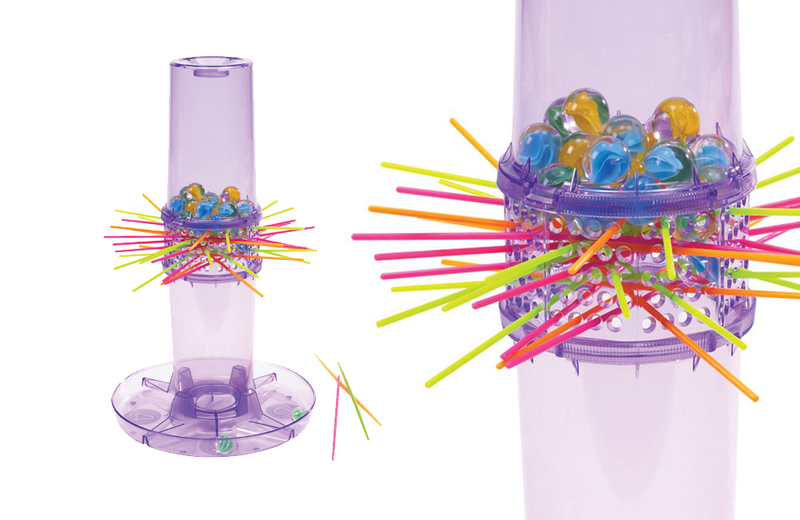 KerPlunk has brought skill and strategy to play since its debut in 1967. Produced by Ideal, the tabletop game is designed for 2 to 4 players, ages 4 and up. Players first assemble the game pieces: a transparent plastic tube with tiny holes around the centre, a base with four receptacles, colourful plastic sticks called straws, and a box of marbles. The tube is placed on the base and plastic straws are inserted through holes in the tube to form an intricate web. Finally, the marbles are inserted through a hole at the top of the tube and rest on the web of straws. Players take turns each pulling a single straw from the tube. Don’t let the marbles fall! The player who lets the fewest marbles pass through the straws wins the game. Since its debut, KerPlunk has been popular with all ages of players. Many iterations have been produced, including Despicable Me and Jurassic World branded versions, along with giant and mini variations. A recent study from the Technology & Social Change Group (TASCHA) at the University of Washington Information School illustrates a direct correlation between using computers for entertainment purposes and the development of computer skills that are transferable to more "productive" computing tasks. Released in 1965 by Kenner, Jet-Strike Bowling tested the skills of amateur bowlers outside of the bowling alley.